I could be really snotty about all of the African inspired projects which seem to be growing in popularity at the moment - sometimes the language used describing Africa as "untapped" musically can sting in ears sensitive to the post-colonial exploitation of the continents' resources. 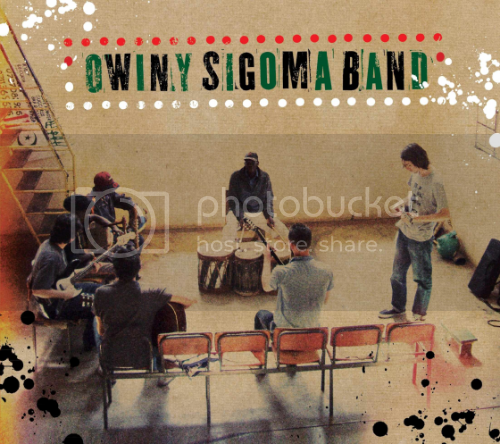 The beauty of music of course is that it's not a resource that can be mined or drilled until it runs out, and the respectful and earnest admiration for this particular fuel make Owiny Sigoma Band an exemplary exporter. Not to mention badass musicians in their own right. In 2009 a close-knit London-based collective of musicians travelled to Kenya to collaborate with local musicians in Nairobi. There they met Joseph Nyamungu – a phenomenal nyatiti player/teacher whose scope of knowledge of traditional Luo music is unparalleled – and Charles Owoko, a drummer specialising in traditional Luo rhythms. A series of inspiring jam sessions concluded with time in a downtown Nairobi studio where the sound developed into something unique, fresh and full of verve. The album comes out on 18th April 2011 on Brownswood Recordings.